An Er:Yb:KGd(PO3)4 crystal doped with 1.83 at.% Er3+ and 3.98 at.% Yb3+ was grown by the top seeded solution method, and polarized spectroscopic properties of the crystal were investigated at room temperature. Fluorescence lifetimes of the 4I11/2 and 4I13/2 multiplets of Er3+ were measured to be about 1.54 μs and 6.32 ms, respectively. Fluorescence quantum efficiency of the 4I13/2 multiplet of Er3+ and energy transfer efficiency from Yb3+ to Er3+ were estimated to be 60% and 62%, respectively. The results indicate that the spectroscopic properties of the Er:Yb:KGd(PO3)4 crystal related to 1.55 μm laser operation are comparable to those of the commercial Er:Yb:phosphate glass and the crystal is a promising gain medium for the eye-safe 1.55 μm laser. P. Laporta, S. Taccheo, S. Longhi, O. Svelto, and C. Svelto, “Erbium-ytterbium microlasers: optical properties and lasing characteristics,” Opt. Mater. 11(2–3), 269–288 (1999). T. Schweizer, T. Jensen, E. Heumann, and G. Huber, “spectroscopic properties and diode-pumped 1.6 μm laser performance in Yb-codoped Er:Y3Al5O12 and Er:Y2SIO5,” Opt. Commun. 118(5–6), 557–561 (1995). P. A. Burns, J. M. Dawes, P. Dekker, J. A. Piper, H. Jiang, and J. Wang, “Optimization of Er, Yb: YCOB for CW laser operation,” IEEE J. Quantum Electron. 40(11), 1575–1582 (2004). N. V. Kuleshov, A. A. Lagatsky, V. G. Shcherbitsky, V. P. Mikhailov, E. Heumann, T. Jensen, A. Diening, and G. Huber, “CW laser performance of Yb and Er, Yb doped tungstates,” Appl. Phys. B 64(4), 409–413 (1997). 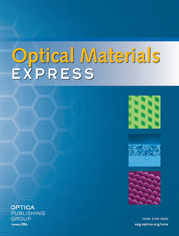 N. A. Tolstik, V. E. Kisel, N. V. Kuleshov, V. V. Maltsev, and N. I. Leonyuk, “Er,Yb:YAl3(BO3)4-efficient 1.5 μm laser crystal,” Appl. Phys. B 97(2), 357–362 (2009). A. J. McGrath, J. Munch, G. Smith, and P. Veitch, “Injection-seeded, single-frequency, Q-switched erbium:glass laser for remote sensing,” Appl. Opt. 37(24), 5706–5709 (1998). N. A. Tolstik, S. V. Kurilchik, V. E. Kisel, N. V. Kuleshov, V. V. Maltsev, O. V. Pilipenko, E. V. Koporulina, and N. I. Leonyuk, “Efficient 1 W continuous-wave diode-pumped Er,Yb:YAl3(BO3)4 laser,” Opt. Lett. 32(22), 3233–3235 (2007). Y. J. Chen, Y. F. Lin, J. H. Huang, X. H. Gong, Z. D. Luo, and Y. D. Huang, “Efficient diode-pumped acousto-optic Q-switched Er:Yb:GdAl3(BO3)4 pulse laser at 1522 nm,” Opt. Lett. 40(21), 4927–4930 (2015). Y. Chen, Y. Lin, J. Huang, X. Gong, Z. Luo, and Y. Huang, “Enhanced performances of diode-pumped sapphire/Er3+:Yb3+:LuAl3(BO3)4/sapphire micro-laser at 1.5-1.6 μm,” Opt. Express 23(9), 12401–12406 (2015). R. Lisiecki, W. Ryba-Romanowski, A. Speghini, and M. Bettinelli, “Luminescence spectroscopy of Er3+-doped and Er3+, Yb3+-codoped LaPO4 single crystals,” J. Lumin. 129(5), 521–525 (2009). R. Parreu, R. Solé, J. Massons, F. Díaz, and M. Aguiló, “Crystal growth and characterization of type III ytterbium-doped KGd(PO3)4: A new nonlinear laser host,” Chem. Mater. 19(11), 2868–2876 (2007). I. Parreu, M. C. Pujol, M. Aguiló, F. Díaz, X. Mateos, and V. Petrov, “Growth, spectroscopy and laser operation of Yb:KGd(PO(3))(4) single crystals,” Opt. Express 15(5), 2360–2368 (2007). R. Maria Sole, M. Cinta Pujol, J. Massons, M. Aguilo, F. Diaz, and A. Brenier, “Growth, anisotropic spectroscopy and laser operation of the monoclinic Nd:KGd(PO3)4 crystal,” J. Phys. D Appl. Phys.48(49) (2015). W. You, Y. Lin, Y. Chen, Z. Luo, and Y. Huang, “Growth and spectroscopic properties of Er3+ single doped and Er3+–Yb3+ co-doped YAl3(BO3)4 crystals,” J. Cryst. Growth 270(3–4), 481–485 (2004). Y. H. Tsang, D. J. Binks, B. D. O. Richards, and A. Jha, “Spectroscopic and lasing studies of Ce3+:Er3+:Yb3+:YVO4 crystals,” Laser Phys. Lett. 8(10), 729–735 (2011). J. F. Philipps, T. Töpfer, H. Ebendorff-Heidepriem, D. Ehrt, and R. Sauerbrey, “Spectroscopic and lasing properties of Er3+:Yb3+-doped fluoride phosphate glasses,” Appl. Phys. B 72(4), 399–405 (2001). G. S. Ofelt, “Intensities of crystal spectra of rare-earth ions,” J. Chem. Phys. 37(3), 511–520 (1962). B. R. Judd, “Optical absorption intensities of rare-earth ions,” Phys. Rev. 127(3), 750–761 (1962). Y. W. Zhao, X. H. Gong, Y. J. Chen, L. X. Huang, Y. F. Lin, G. Zhang, Q. G. Tan, Z. D. Luo, and Y. D. Huang, “Spectroscopic properties of Er3+ ions in Li6Y(BO3)3 crystal,” Appl. Phys. B 88(1), 51–55 (2007). B. F. Aull and H. P. Jenssen, “Vibronic interactions in Nd:YAG resulting in nonreciprocity of absorption and stimulated emission cross sections,” IEEE J. Quantum Electron. 18(5), 925–930 (1982). D. S. Sumida and T. Y. Fan, “Effect of radiation trapping on fluorescence lifetime and emission cross section measurements in solid-state laser media,” Opt. Lett. 19(17), 1343–1345 (1994). D. E. McCumber, “Einstein relations connecting broadband emission and absorption spectra,” Phys. Rev. 136(4A), A954–A957 (1964). X. Zou and H. Toratani, “Evaluation of spectroscopic properties of Yb3+-doped glasses,” Phys. Rev. B Condens. Matter 52(22), 15889–15897 (1995). W. J. Miniscalco and R. S. Quimby, “General procedure for the analysis of Er3+ cross sections,” Opt. Lett. 16(4), 258–260 (1991). Y. Liao, Y. Lin, Y. Chen, Z. Luo, E. Ma, X. Gong, Q. Tan, and Y. Huang, “Radiative-trapping and fluorescence-concentration quenching effects of Yb:YAl3(BO3)4 crystals,” J. Opt. Soc. Am. B 23(12), 2572–2580 (2006). A. Muñoz, B. Herreros, G. Lifante, and F. Cusso, “Concentration dependence of the 1.5 μm emission lifetime of Er3+ in LiNbO3 by radiation trapping,” Phys. Status Solidi168(2), 525–530 (1998) (a). D. K. Sardar, J. B. Gruber, B. Zandi, J. A. Hutchinson, and C. W. Trussell, “Judd–Ofelt analysis of the Er3+(4f11) absorption intensities in phosphate glass: Er3+, Yb3+,” J. Appl. Phys. 93(4), 2041–2045 (2003). G. Karlsson, F. Laurell, J. Tellefsen, B. Denker, B. Galagan, V. Osiko, and S. Sverchkov, “Development and characterization of Yb-Er laser glass for high average power laser diode pumping,” Appl. Phys. B 75(1), 41–46 (2002). N. A. Tolstik, A. E. Troshin, S. V. Kurilchik, V. E. Kisel, N. V. Kuleshov, V. N. Matrosov, T. A. Matrosova, and M. I. Kupchenko, “Spectroscopy, continuous-wave and Q-switched diode-pumped laser operation of Er3+, Yb3+: YVO4 crystal,” Appl. Phys. B 86(2), 275–278 (2007). P. Wang, J. M. Dawes, P. Burns, J. A. Piper, H. J. Zhang, L. Zhu, and X. L. Meng, “Diode-pumped cw tunable Er3+: Yb3+: YCOB laser at 1.5-1.6 μm,” Opt. Mater. 19(3), 383–387 (2002). S. T. Eichhorn, S. T. Fredrich-Thornton, E. Heumann, and G. Huber, “Spectroscopic properties of Er3+: YAG at 300-550 K and their effects on the 1.6 μm laser transitions,” Appl. Phys. B 91(2), 249–256 (2008). Fig. 1 Photograph of the Er:Yb:KGP crystal sample. Fig. 2 (a) RT polarized absorption spectra of the Er:Yb:KGP crystal in a range from 280 to 1700nm. (b) RT polarized absorption cross-section spectra of the Er:Yb:KGP crystal from 900 to 1050 nm. Fig. 3 (a) RT polarized emission cross-section spectra of the 4I13/2→4I15/2 transition of Er3+ in the Er:Yb:KGP crystal calculated by the F-L formula. (b) Comparison of emission cross-section spectra of the 4I13/2→4I15/2 transition of Er3+ in the Er:Yb:KGP crystal for E//Y polarization calculated by the RM and the F-L formula, respectively. Fig. 4 Gain curves of the 4I13/2→4I15/2 transition of Er3+ in the Er:Yb:KGP crystal for E//Y polarization with different β. Table 1 Comparison of some spectroscopic parameters of the Er3+ and Yb3+ co-doped crystals and glass related to the 1.55 μm laser. Comparison of some spectroscopic parameters of the Er3+ and Yb3+ co-doped crystals and glass related to the 1.55 μm laser.